We are here again, for another SOTM blog hop! This month we’ve got almost 60 consultants participating. If you came from Tamytha, the Paperheartist, you’re on the right path. If this is your first stop, just keep clicking the links at the end of each post until you get back here. How fun is that!!! I love that it matches with one of the Art Philosophy images, that the higher numbers are stamps, too, so that I don’t have to stamp a 3 and a 0 to make 30. This set is perfect for any kind of event, for invitations but also layouts. I had so much fun creating this layout, following the Sidebar-Main Frame pattern from Reflections. I’m a year and a half behind, since my daughter has had her 6th birthday already, but I love this photo of her. It was taken during her first birthday party with her friends. I printed the photo in black and white so I could use any colour and I decided on blue because that is Arianna’s favourite. I loved the way the stamps were all rectangular. To show that my focus was on a year, I stamped each image a number of times, in a type of random grid, using Indian Corn Blue ink on Indian Corn Blue cardstock. 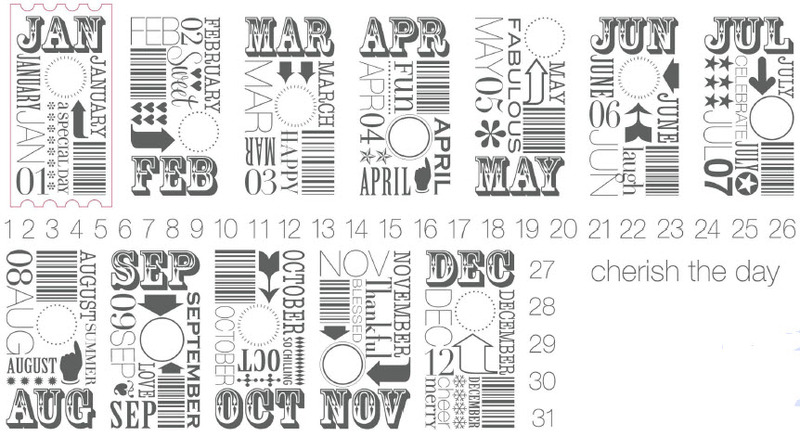 Then, you’ll see the May stamp on the tag, since her birthday is May 30. I chose to cut a different image than the ticket one because this bracket rectangle looks more girly. And here is a close-up of the embellishment cluster. Now it’s time to hop on over to Katy’s blog and drool over the artwork she’s created. Great layout – love the colors! Oh my gosh Krista, this is a darling layout!! Beautiful layout. The colors are gorgeous with that black and white photo. Super cute! I’m so excited about all the scrapbook pages and layouts on this hop! 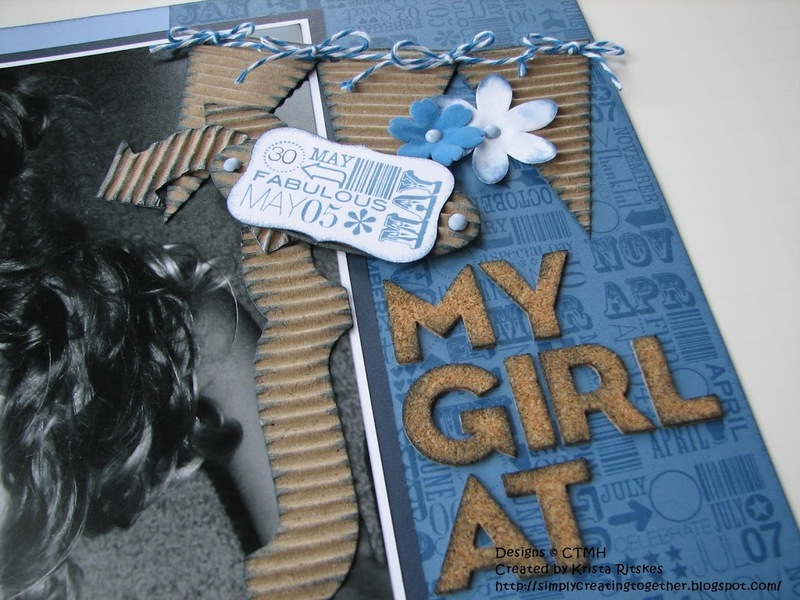 LOVE the monochromatic feel to this layout…so CUTE! Great idea – will definitely have to do this fun layout for my daughter too! This is so striking. 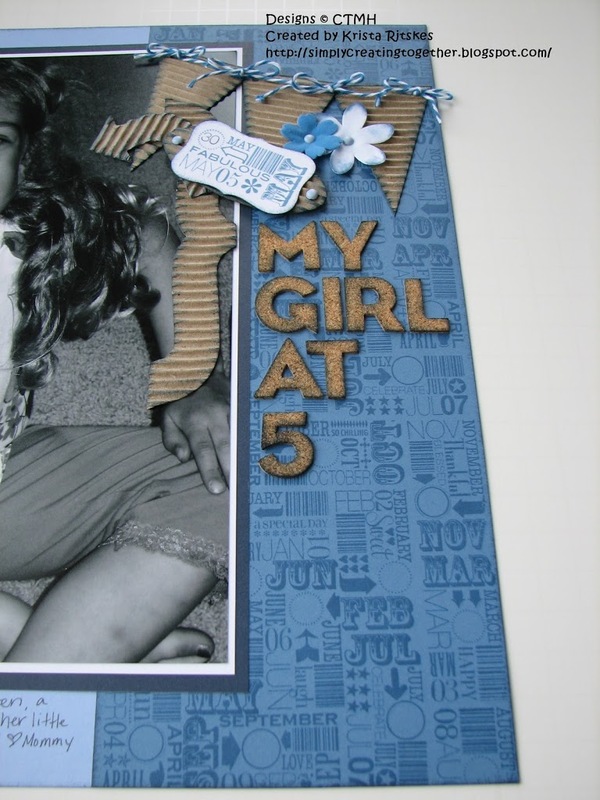 Simple layout, but you’ve added so many great embellishments. Awesome! Love the blues and the black & white photo!!! So adorable – the layout and the picture! 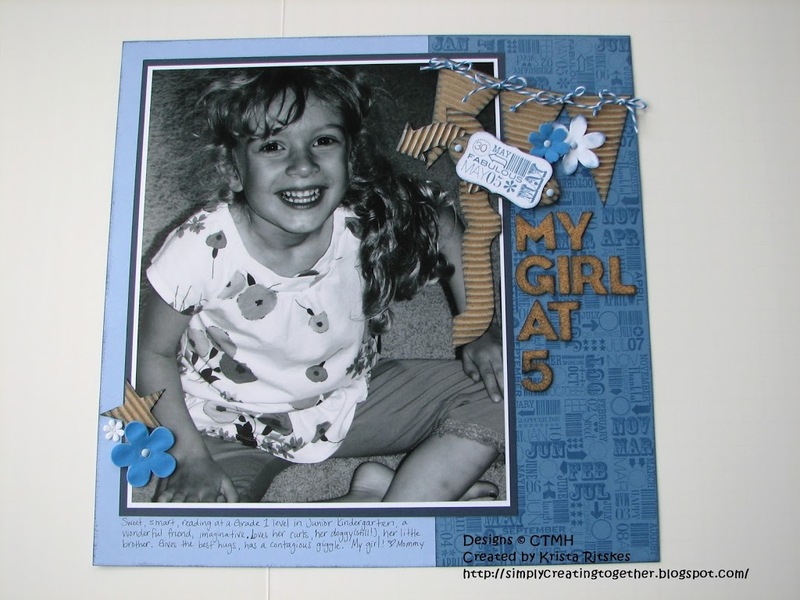 Your daughter is adorable, and this layout totally captures her cuteness! Love this set as a background image! this LO is really fantastic!